Ах-Пуч (Ah Puch) — бог смерті у міфології майя, правитель Метнала, найнижчого рівня Шібалби (підземного царства). Також відомий як Хун-Ахау (Hun Ahau, де перший звук /a/ іноді нехтується, і слово вимовляється як «хунхау»). Alfredo Barrera Vázquez, El libro de los cantares de Dzitbalche. INAH, Mexico 1965. Nikolai Grube and Werner Nahm, A Census of Xibalba. The Maya Vase Book Vol. 4, New York 1994: Justin Kerr. 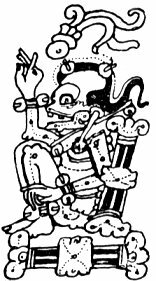 Nikolai Grube, 'Akan – the God of Drinking, Disease, and Death', in Graña Behrens et al., Continuity and Change: Maya Religious Practices in Temporal Perspective (Acta Mesoamericana Vol. 14, 2004). Stone, Andrea, and Marc Zender, Reading Maya Art: A Hieroglyphic Guide to Ancient Maya Painting and Sculpture. Thames and Hudson 2011. Цю сторінку востаннє відредаговано о 12:44, 10 вересня 2017.